“The Rising Tide” by C.A.L. 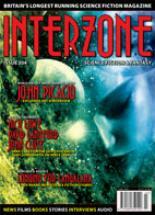 We begin our review of Interzone 204 with unrequited love. Yes, unrequited love. In Mercurio D. Rivera’s “Longing for Longalana,” the entire Wergen species has a crush on humanity. There isn’t a lot of detail on why this is, and the why isn’t that important. All you need to know is that to every Wergen, a human is the most beautiful being in the universe. Humans don’t have any such fascination with the Wergen, but they are interested in the Wergen’s superior technology. And so, a whole host of thorny questions about the nature of love and the ethics surrounding it are raised. There are no answers in “Longalana,” but that’s OK. It’s enough that it asks interesting questions in an interesting way. In 1948, the vessel Altalena was destroyed by the newly christened Israeli Defense Force; it had previously been referred to as the Hagana, as it approached Tel Aviv. On board the vessel were weapons, supplies, and around 900 militants. So which Islamic faction did these militants belong to? None. They were Jewish militants belonging to the Irgun, headed by future Israeli Prime Minister Menachim Begin (who, while he was on board the vessel, obviously survived its destruction). While it’s never been officially stated, it is rumored that the commander of the IDF force that destroyed the Altalena was future Israeli Prime Minister Yitzhak Rabin, who was assassinated in 1994. Now you know as much as I do about the actual history Martin J. Gidron is altering in “Palestina,” the story of an adolescent girl growing up in the Arab and Soviet run concentration camps after the failure of Israel. This pivotal moment in Israeli history, which I knew nothing about until researching for this review, is only referenced once in the story. It’s a throwaway reference that doesn’t even mention the Altalena by name but is carefully crafted to appear vital to the message of the story. So, what’s the message? I don’t know for certain. The most likely message in my mind is: to create a successful state Palestinian leaders (or anyone forming a nation) must set aside internecine disputes, politics, and the avenging of perceived or real wrongs and act for the best interests for the nation. However, there are several more dubious possibilities that my limited knowledge of Israeli politics and history can’t rule out. Still, it’s at least an interesting story, if for no other reason than the research it inspired. The rebellion will end tonight. The United Starion Republic will activate the biomines seeded in the atmospheres of the rebellious Veil Worlds, and with that the Veil Worlds will forever be cut off from the rest of the Republic. There is one problem, though: the activation code has gone missing. In “The Rising Tide” by C.A.L., retrieving it will bring Rayleigh Marsonnet home to the barbaric world he betrayed, the woman he loved, and a black sea that kills all it touches. “The Rising Tide” is a story that promises much action and delivers much posturing. This isn’t necessarily a bad thing. I like how brief and deadly the violence is. It makes the world seem much more dangerous. However, to me, the dialog is a little too stilted to take itself as seriously as it does, and the narrative dwells a bit much on how bad the characters’ asses are. Still, there are lots of nice ideas here, and some of the imagery is quite evocative. These don’t save the story for me, but they do make me glad to have read it. Speaking of interesting ideas, in “Summer’s End,” Jamie Barras gives us a world where the entire population of the Earth wakes up to find five months have past and the world has changed. While the story does touch upon the large scale difficulties this has caused, the stories emotional impact comes from the author’s focus on the much more intimate problem of the main character. This is also one of the few times where an ending that is an obvious prompt for sequels (it’s just short of “The End…?”) actually made me interested in reading those sequels, though I think a series of parallel stories in the same setting would be more interesting than direct sequels. I recommend checking it out if you ever get the chance. The final story of Interzone 204, “A Brief History of the Dream Library” by Elizabeth Hopkinson, is… well, it’s just neat. It’s also the winner of the 2005 James White Award. Milton Bisset of Bradford checked a dream out of the Great Thornam Dream Library in 1984. Now it’s 2004, and in the interests of public safety, the government wants the dream back. Given the title, it should come as no surprise that “Dream Library” is an ethereal-feeling modern fantasy that shares echoes with the works of Neil Gaiman, Susanna Clarke, and J. K. Rowling. It’s an excellent little piece, and an excellent bookend to the issue.